Recognise or Recognize – What’s the Difference? Home » Recognise or Recognize – What’s the Difference? Differences between American and British English are well catalogued, and come in the form of verb conjugation, word use, and even spelling. One of the more consistent differences between the two language communities (American and Britain) involves the American tendency to change the –ise ending to –ize, to more closely reflect its spoken pronunciation. This trend can be seen in a number of words, including idealize, realize, baptize, criticize, and, of course, our word today recognize. Even the British seem to be coming around to the –ize ending, though. They use both recognise and recognize. Which version should you use? Continue reading to learn more about the differences between these two confusing words. 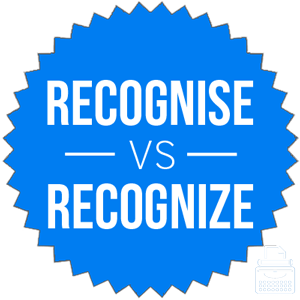 What is the Difference Between Recognise and Recognize? In this post, I will compare recognize vs. recognise. I will use each of these words in example sentences that will display the words in their appropriate contexts. I will also show you a memory tool that makes choosing either recognize or recognise much easier in your own writing. What does recognize mean? Recognize is a verb. It means to see something as legitimate or to correctly identify something. Babies can accurately recognize emotions in strangers’ faces from a very early age. Someone who recognizes that his or her own behavior is a problem is probably on a path to self-improvement. “I recognize that the council has made a decision, but given that it’s a stupid decision, I have elected to ignore it,” the scribe paraphrased. “Hi Charity, I almost didn’t recognize you with your new haircut!” said Faith. Recognize is a modification of a French verb. The French borrowed it from Latin. It was first recorded in English in 1537. What does recognise mean? Recognise is an alternate spelling of the same verb. It means the same thing and can be used in all the same contexts. Recognise is more common in British English than it is in American English. That said, even the British prefer recognize—and have for some time. These charts aren’t exhaustive in their data, since they only look at books published in English since 1800, but they still provide a good visualization of an important long-term usage trend. In most cases, you should default to recognize. It is acknowledged in both main forms of English. If you are writing for an editor from the United Kingdom who insists on recognise, don’t feel bad about using it. It is an accepted variant. In most cases, recognize is a better choice since it will be familiar to all readers. Since recognise has an S, like the British town of Surrey, remembering that recognise is chiefly a British variant should not be difficult. Is it recognise or recognize? Recognize and recognise are spelling variants of a verb that can means to identify, to acknowledge, or to see something as legitimate. Recognize is the standard form in both AmE and BrE. Recognise is more common in BrE than it is in AmE, but recognize is still more widely used. 1 What is the Difference Between Recognise and Recognize? Loveable or Lovable – Which Spelling is Correct? Seam or Seem – What’s the Difference?